With summer upon us and in full swing, there are a few essentials you need to make the best of these heated days. Staying fresh and looking chic are important, but hard to maintain in sweltering heat waves. Here are some of my favorite products to help get you through the rest of this hot season without cramping your style. These clips are a must-have for any summer top. They can convert your regular bra into a racer-back style in no time and keep your straps from slipping. With clear and black options, they will be discreet and keep you comfortable all day and night long. With the summer heating up, this stylish metallic headband is the perfect solution to keep your hair looking great and off your face. 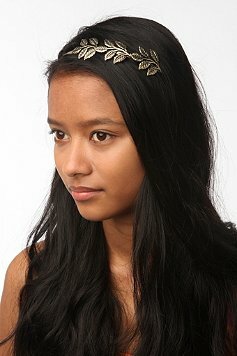 The pretty leaf detail adds a bit of boho chic to any outfit. Avoid raccoon eyes and keep your lashes looking fresh all day, with this waterproof topcoat. The lightweight formula goes on smooth and won’t clump your already applied mascara. Added bonus: it can be used to give your lashes an extra boost throughout the day. Tote this fashionable beach mat to your next outdoor adventure. Whether it’s to the beach or the park, you will be able to relax in style. And it’s super easy to carry, just roll up and go. Keep cool with this Evian Mineral Water Spray. The formulated spray will revive your makeup and give an added boost of freshness to your day. It’s also great for rehydrating sunburnt or dry skin. Have fun in the sun while protecting your skin with this easy SPF waterproof spray. The nicely scented formula is lightweight, non-greasy and contains natural ingredients. Perfect for an adventurous summer day outdoors, especially since you can apply on your skin even if it’s wet. Renew your skin after a day in the sun with this After Sun Hydrator. The formula will prolong your tan and moisturize sun soaked skin. Complete with anti-aging antioxidants and anti-inflammatory extracts to keep skin looking and feeling fresh.